If one isn't careful, the work of researching family history can overwhelm one's regular life. There are always more names to research, more information to gather, and more information to include. There is always another relative, no matter how distant, who piques one's interest and demands to be researched. In this respect, all of one's ancestors, no matter how humble, are of interest. Curiosity drives the family historian. Beginning with Patrick and Mary; Laurence and Johannah; Thomas and Mary; Martin and Edith; Edgar and Hilda; my brother and I; to the present day of our children'we have been in Canada for seven generations. We arrived here in the late 1830s with very little but each other and our family values. Each generation has made a contribution to Canadian life, and to the betterment of our country and family. This family history is truly a labour of love to our ancestors and to Canadian society. This chapter takes us to the present time, with a brief discussion of my brother and myself. Of course, as time goes on new information can be added, but for now I must bring this work to a conclusion. 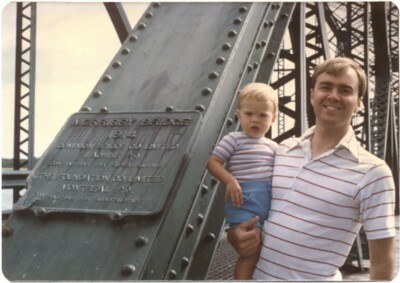 John Morrissey and his son David at the Morrissy Bridge, Miramichi, New Brunswick, in 1978. My brother John R. Morrissey attended West Hill High School in N.D.G., Montreal, and earned his B.Eng at McGill University. Then he attended the Massachusetts Institute of Technology in Cambridge, Massachusetts where he earned his Master of Science degree. These were the late 1960s, the years of the war in Viet Nam, and I still have letters from John discussing the war and student demonstrations. After a few years of working as an engineer he decided upon a carer in law and attended the University of Ottawa and has met great success in this field. He and his wife, Katherine Thompson, live in Toronto, Ontario; their two children, Heather and David, are both university students. I attended Monklands High School in N.D.G., Montreal, then Sir George Williams University where I earned my B.A., Honours in English, with Distinction (1973), and my M.A. in English from McGill University (1976). I married Patricia Walsh in 1976 and we had one child, Jake Morrissey, in 1979. The marriage ended in divorce in 1989 and I remarried, to Carolyn Zonailo, in 1995. My son, Jake Morrissey, studied at Concordia University, Royal Holloway-University of London, in England, and plans to continue his studies at McGill University. I have taught English literature at Champlain College since 1976 and have published seven books of poetry and numerous book reviews and critical articles. We continue to live in Montreal. 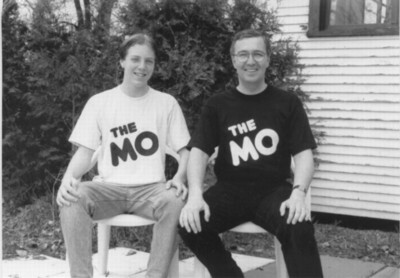 Jake Morrissey and his father Stephen Morrissey, wearing t-shirts from the Morrissey Tavern, Spring 1992. Beginning in Ireland, then moving to New Brunswick, Quebec, and then elsewhere in Canada and the United States, our family has flourished. We owe a debt of gratitude to Canada, a country of freedom, opportunity, and respect for the individual. As a family we have been blessed by God and country.